It will often happen that I come up with what I think is a unique recipe idea. I will be so excited to give it a try and share it with all of you. And all too often I will be ready to cook my creation but then google it real quick, just to see if somehow this original idea has been thought of before, and it most likely has. More than likely, any idea of mine has been thought up at least 153 times before. This is no lie. But hey, they say great minds think alike – so if this many people have this idea along with me, it must be a good one, right? Well, if we are basing it off this recipe the answer would be right. It is delicious and a must try. I am a HUGE fan of homemade macaroni & cheese and I can honestly say I will be adding pumpkin puree to mine in the future. It is that amazing! 2. Bring water to boil, cook according to noodle package – approx. 8-10 minutes. Drain. 9. Bake uncovered for 25-30 minutes or until golden and bubbly. I saw this recipe on my Google Reader and popped right over. How intriguing! Is it sweet? I'll have to Google Mostaccioli--I haven't heard of it. I do love Mac and Cheese and the flavor of pumpkin. The color will be perfect as well. Nice post! I've been dying to try this and your pictures make me want it even more!! 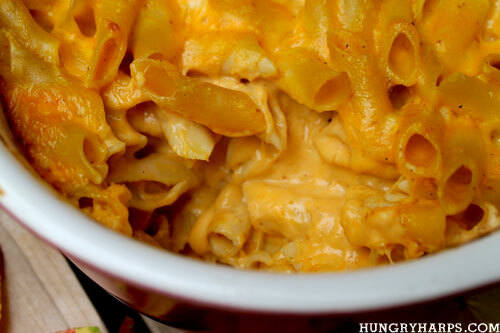 Oh my god, that looks SO creamy, cheesy, and yummy! I make a butternut squash mac & cheese that is killer. Seeing your pumpkin mac & cheese makes me think there's something about squash in general that makes for an awesome mac & cheese! This looks absolutely delicious! So rich and creamy. I never would have thought to have put pumpkin in mac & cheese. Great recipe! Oh my gosh! I am drooling! 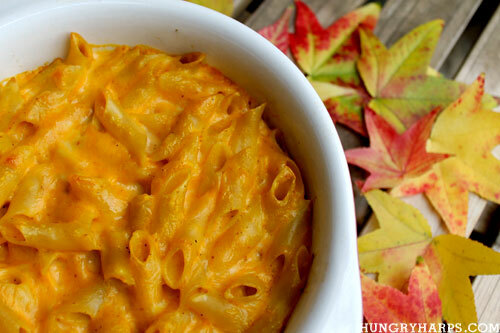 I love pumpkin and I love mac & cheese so definitely making this dish. Thanks for sharing! now that is truly perfection in a macs and cheese..thank you so very much for sharing! That happens to me all the time! I guess it's just a sign that there are LOTS of foodies in the world, craving similar things. This looks so comforting and delicious, that I can see why! This looks great!! I am so intrigued by the addition of pumpkin. I may have to try this and soon! Your gorgeous photo just leaps off the Top 9 page today! Congratulations on a worthy post. Just lovely. I made this for dinner tonight, it was a hit. I've made pumpkin mac n cheese in the past but I like your recipe better. Very creamy and not too many ingredients involved. Thanks for sharing. This is truly a new twist on mac n cheese. Please share it today on foodie friday.